If the same learner launches your course more than once, the Resume feature in Storyline determines how the course behaves on subsequent visits. Or, you can display a prompt that allows the learner to choose. The resume behavior is part of the player you apply to your course. 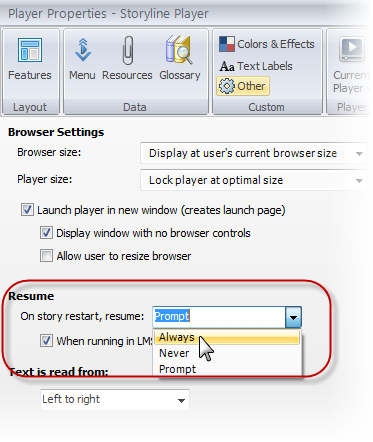 To customize the resume behavior, you'll need to open the Player Properties window. First, click the Home tab on the Storyline ribbon, and then click Player. When the Player Properties window appears, click Other. Always: This causes your course to automatically open at the place where the learner left off last time. Users won't see a prompt; the resume just happens automatically. Never: This causes your course to always open at the beginning of the course, regardless of whether the learner already completed part of the course previously. Users won't see a prompt. If your LMS supports bookmarking, mark the box labeled When running in LMS, ignore Flash cookie. The LMS will control resume behavior in this scenario. If your LMS does not support bookmarking, uncheck When running in LMS, ignore Flash cookie. The Flash cookie will control resume behavior in this scenario. If you've enabled a resume prompt and you want to customize what it says, that's easy to change. The text comes from your player's Text Labels, which you can customize from the Player Properties window. If you need help editing the text labels, check out this tutorial. 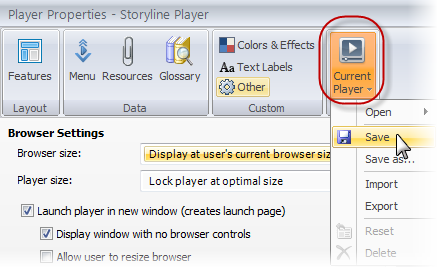 If you click OK on the Player Properties window and then save your project by clicking the Save button above the Storyline ribbon, Storyline saves your player customizations within your project. It's a good practice, though, to save your player separately, because this allows you to apply the same player customizations to other projects if you like. For more details about using the Current Player options, see the tutorial called Saving Your Player or Switching to a Different One.